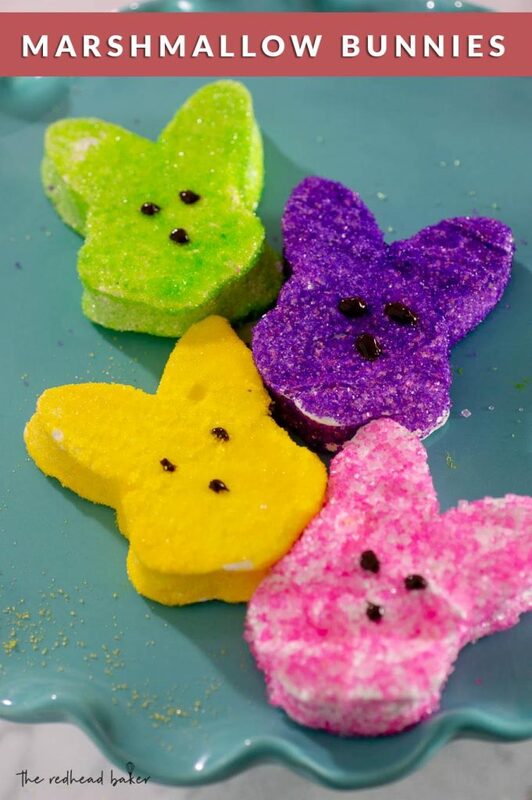 If you think you don’t like those ubiquitous Easter bunny (and chick) marshmallows, make your own at home! It’s messy, but the flavor is so much better! Ready for a secret? I don’t like them. I don’t know why. I love marshmallows. I even get the “marshmallow lovers” version of hot cocoa packets at the grocery store. Some of my favorite cereals are the kiddie kinds with the marshmallows in them! So, I decided to make my own. I will take homemade marshmallows over store-bought (of any kind) any day. 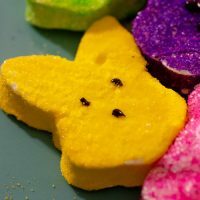 I first made marshmallows in my candy class in culinary school. It was fun! It was messy, but come to think of it, that was part of the fun. As you’ll see in the video I made, fresh marshmallow is sticky. You can spray your spatula with half a can of nonstick spray, and it will still stick. If you’re like me with other recipes, and you try to scrape every bit of batter out of the mixing bowl, do not even attempt it with marshmallow. Not gonna happen. The good news is, fresh marshmallow is mostly sugar and water, so washing up is easy. Everything just melts away when rinsed under hot water. And don’t toss those scraps after cutting out your marshmallows. 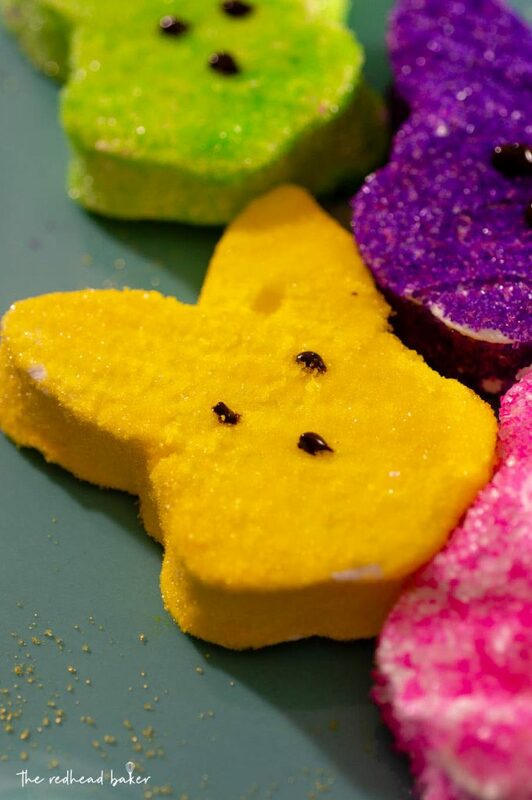 Cut them into bite-size pieces, toss them in more of your confectioners sugar/cornstarch mixture and store them in an airtight container at room temperature. 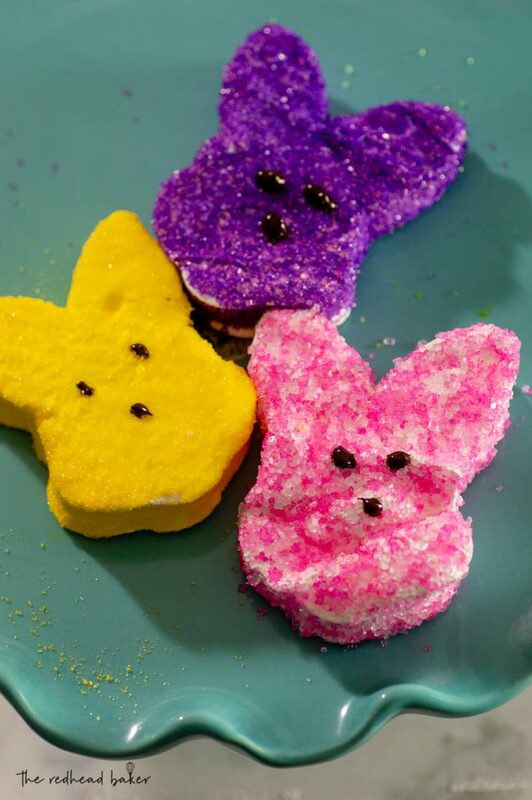 Make your own sugar-coated bunny marshmallows at home with this foolproof recipe! They taste even better than store-bought. Turn the mixer on low speed and, while running, slowly pour the sugar syrup down the side of the bowl into the gelatin mixture, avoiding the whisk attachment if possible. Once you have added all of the syrup, increase the speed to high. Continue to whip until the mixture becomes very thick and is lukewarm, approximately 12 to 15 minutes. Add the vanilla during the last minute of whipping. While the mixture is whipping prepare the pans as follows. Turn the marshmallows out onto a cutting board. Dip your bunny cookie cutter all the way into the confectioners sugar/cornstarch mixer and use it to cut bunny shapes in your sheet of marshmallow, re-coating the cutter frequently. Place the sanding sugar in a quart-sized zip-top bag. Lightly spritz a few bunnies at a time with water, then seal in the bag with the sanding sugar. Shake to coat. Repeat until all marshmallows are coated. Melt the chocolate chips in a microwave-safe bowl. Pour into a small piping bag. Snip a very small bit off of the pointed end, and pipe two small eyes on each bunny. Let sit at room temperature until set. Want to experiment with flavored marshmallows? Sub another flavored extract (lemon, almond, etc.) for the vanilla extract.